Pyramid training is an effective method of strength training that’s popular both among successful athletes and those of us who train to maintain a good health and fitness for our everyday lives. What is a pyramid training schedule? A pyramid is a structure of sets and reps for any exercise you do in a training session. 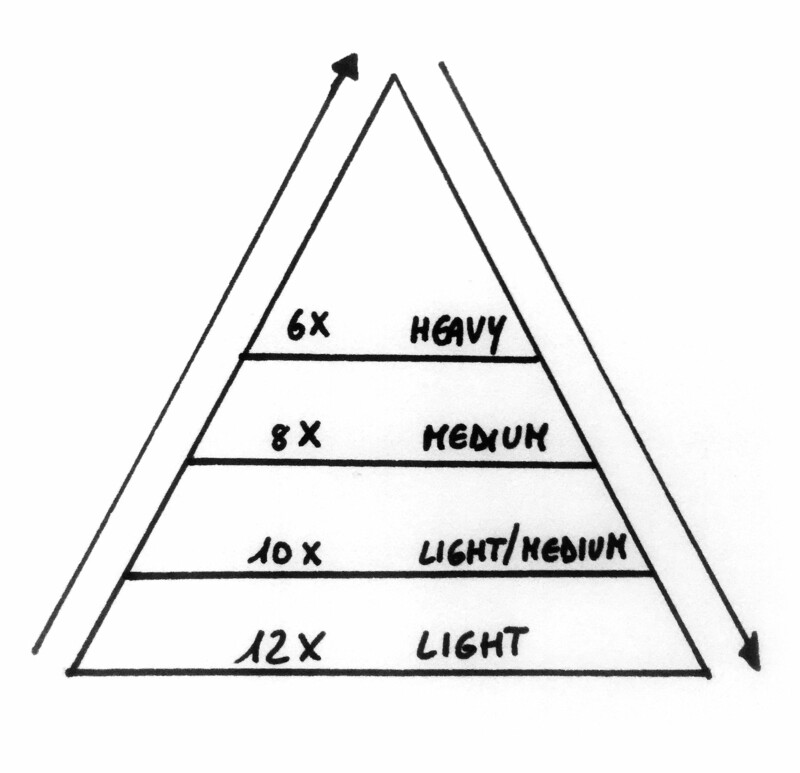 In the basic ascending pyramid, you will start with a light weight and then you will increase the weight for each set that you do. As you are adding weight, the number of reps that you can do will decrease. What are the advantages of pyramid training? You automatically include warm up to your training session. With ascending pyramid training, you will start your training with a light weight that will get the target muscles warm and ready for heavier weights in the following sets. By doing this you will be able reduce the risk of injury during the training. 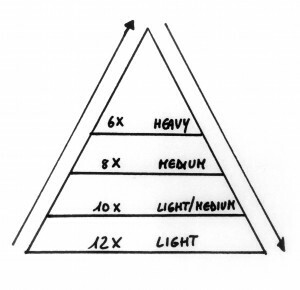 A pyramid set design will give you a high volume workout. When you are following an ascending-pyramid schedule and increasing the weight set by set, you will end up doing a lot of sets and this will give you a high volume of work, which is great for achieving muscle growth, or hypertrophy (1). It’s beneficial to load your muscles in different ways (both higher reps and lower) (1). In addition, change is fun and motivating, feels like the training is going faster than if you do the same thing over and over. Which kinds of pyramid training can you try? In this pyramid routine you increase the weight and decrease the reps for each set. In this routine you decrease the weight and increase the reps with each set. It’s important that you warm up with a light set before you start your descending pyramid since you start with a heavy set first. This routine allows you to do both ascending and descending pyramids during the same workout. Once you are able to finish a pyramid at a given weight with good form, you need to progress to a higher weight for the next training. Did you ever try pyramid training? What pyramid suits you? If you have any questions before getting started with your new pyramid training schedule, write in the comment section below or book an appointment with me! This entry was posted in Strength training and tagged pyramid training, strength training, training programs. Bookmark the permalink. Great site! I truly love how it is easy to understand and well written. I am wondering how I could be notified whenever a new post has been made. Have a great day! I was recommended this website by my cousin. You’re amazing! Thanks! Simply wish to say your article is as astounding. The clarity in your post is just excellent and I can assume you are an expert on this subject. Thanks a million and please carry on the enjoyable work. Wow, fantastic blog structure! The overall look of your website is wonderful, let alone the content material!